Whales and dolphins (Cetaceans) live in tightly-knit social groups, have complex relationships, talk to each other and even have regional dialects - much like human societies. A major new study, published today in Nature Ecology & Evolution, has linked the complexity of Cetacean culture and behaviour to the size of their brains. The study is first of its kind to create a large dataset of cetacean brain size and social behaviours. The team compiled information on 90 different species of dolphins, whales, and porpoises. It found overwhelming evidence that Cetaceans have sophisticated social and cooperative behaviour traits, similar to many found in human culture. The study demonstrates that these societal and cultural characteristics are linked with brain size and brain expansion—also known as encephalisation. "That means the apparent co-evolution of brains, social structure, and behavioural richness of marine mammals provides a unique and striking parallel to the large brains and hyper-sociality of humans and other primates on land. Unfortunately, they won't ever mimic our great metropolises and technologies because they didn't evolve opposable thumbs." They argue that large brains are an evolutionary response to complex and information-rich social environments. However, this is the first time these hypotheses have been applied to 'intelligent' marine mammals on such a large scale. Dr Michael Muthukrishna, Assistant Professor of Economic Psychology at LSE, added: "This research isn't just about looking at the intelligence of whales and dolphins, it also has important anthropological ramifications as well. In order to move toward a more general theory of human behaviour, we need to understand what makes humans so different from other animals. And to do this, we need a control group. Compared to primates, cetaceans are a more "alien" control group." Dr Kieran Fox, a neuroscientist at Stanford University, added: "Cetaceans have many complex social behaviours that are similar to humans and other primates. They, however, have different brain structures from us, leading some researchers to argue that whales and dolphins could not achieve higher cognitive and social skills. I think our research shows that this is clearly not the case. Instead, a new question emerges: How can very diverse patterns of brain structure in very different species nonetheless give rise to highly similar cognitive and social behaviours?" How is dolphin intelligence impacted by their heavy mercury poisoning? To what extent is their intelligence impacted by human activity? You mean - I might be even smarter if it wasn't for all that mercury I rolled around in my hands, as a kid...?!? I think you could say the same for just about any species. Even earthworms may have the same abilities, who knows. "They, however, have different brain structures from us, leading some researchers to argue that whales and dolphins could not achieve higher cognitive and social skills." The exact opposite may be true. While the human species is considered to be roughly a few million years old at best, dolphins have been around roughly ten times a long. They have had plenty of time to evolve superior structures. 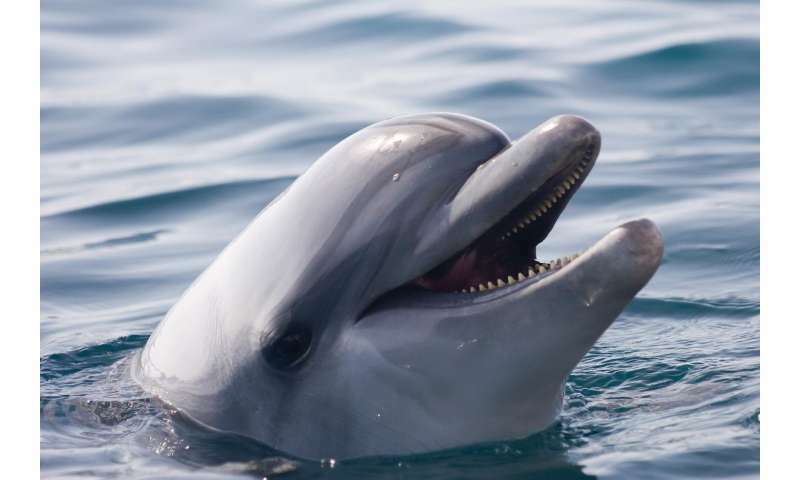 Seeing how we often treat each other so poorly, and this behavior is not usually reflected in dolphins, I would not be too smug that we are always the superior species. We seem to know this inherently as well. People seem to have little reluctance entering the water with dolphins, but are far more cautious around large primates. Some people, e.g., Japanese, kill and eat dolphins, but dolphins do not inflict this on us like a shark would, although they could easily overpower us in the water if they choose too. Humans look for themselves everywhere. When it turns out that we were once again fooled, and thought we saw ourselves when we were really looking at something else, we then discount whatever it was we were actually observing. If what we were observing was a living thing, and it isn't us, or it doesn't mimic us, we immediately see that living thing as inferior. Of course that view is completely biased, and nearly always dead wrong. When we try to eliminate the bias, to the extent that we can, we can see our place in the natural order of things a little more clearly. It at least has allowed us to realize that the universe doesn't revolve around us.... and there will be intelligent life on this planet after we have drowned in our own excrement. Perhaps it would be more accurate to say that humans have achieved development of culture and society nearly whale and/or dolphin like, though deeply flawed. Z, you make some good points, e.g., it is essential to remove our human-centric bias to see things as they actually are. It seems to me we have no hope of understanding what alien worlds are like if we can't even understand this one. Some people act like we are the only intelligent creatures that ever existed on Earth or we are the only ones with any technology. Both of these ideas are wrong. Many species have a fair measure of intelligence and although tool use by other species is very limited, e.g., chimps using sticks for removing termites to eat, dolphins using sponges to help dig up clams, etc., this is still tool use (technology). We may still be smug about our technology being so much more advanced, but when I think about how advanced aliens may view us, their first question is whether we able to travel through space to other worlds or not. Right now, we do not have that capability so we fail that test. We should remedy that. With computers surely we can crack the code by which dolphins "converse".